One of my haphazard convention traditions has been acknowledging the people who take time to prepare games to run for people over the course of three hours, usually RPGs, with a personal card and gift, either at the event or shortly afterward, from my own pocket or convention funds. I know the own pocket thing was a bad habit to get into but if there was only one area for me to donate money to our fledgling convention, I was happy for that to be it. This year, exhausted and quite literally broken by a variety of physical factors in July/August, I am typing this from a standing position on a rickety train, hurtling towards the city, because my handwritten cards would much harder to read. This post is a letter to all of our GMs, past, present and future, about how things are going, and how grateful I am to each of them for their role. To date, we have run 227 hours of RPGs, across 76 sessions these past 7 events (within 3 years). Twenty-four different people have played the role of Game-Master, and you’re all just wonderful for doing so. We hope it’s worth the effort for you, in prep, and travel, patience and expertise. We see a lot of smiles at your tables! Special mentions this year go to Rodger Dean for achieving Gold status (running 4 or more sessions within a calendar year), a title previously only held by masochistic-marathon-runner Jez Gordon, who still holds the crown of most sessions/hours of GM duties at our convention overall. We’d also like to acknowledge Jack Maidment, Torrey Keown and the Storybrewers (Hayley Gordon and Vee Hendro) for running concurrent sessions across the divide of years, effectively missing out on certain accolades (because being a Con Org is all about making decisions you may come to regret). Player lists were printed in advance and left at the front desk for each GM to collect an hour before their session. Also included were copies of our new GM Procedures and enough feedback forms for each of your players. This is good! We’ll do this again next time. Worldbuilder sheets, envelopes and badges were also included for those sessions envelopes. Yay! The wiki will be updated by November. We should’ve had your award badges in those envelopes, but time was not on our side. They’re in the post today, with our ethereal apologies. Copies of the GM Procedures should have also been attached to each RPG table, but again, time/panic/confusion saw us forget. Next time, we’ll have them laminated and stuck! Some GMs didn’t collect their envelopes, but we did our best to walk them to your tables once the session had begun. We’ll label them better next time, but please try to collect them yourself so that we don’t need to run around. We acknowledge it’s a new thing to worry about, and you may have missed an email or forgotten, but we really haven’t had enough staff to deliver them for about a year. If you, or anyone else at the table, has any seating requirements or communication tools to make it easier to hear or be heard, please take the time to make that easier for all of you. If you need anything from us on that front, don’t hesitate to ask. I requested a seat swap with one of my players to ensure I could see and hear everyone better, and it worked out great. A couple of GM envelopes were never opened, so lists weren’t checked, and feedback forms didn’t get to those players. We’ll contact them via email to see if they have anything they’d like to share. Although we’re sure some GM procedures were adhered to regardless, we’d recommend you take the time to check your envelope next time in case there’s a present in there for you. Thanks! Should you need to cancel your session, please ensure that you use Eventbrite to advise your players, or at least give me a call on my mobile if you can’t get through to me via email or other web-messages. If you need my number, just email info@ettincon.org and I will pass it on. If I’m only hearing about this on the day, I can’t be sure I’ll have time to notify your players beyond some red sharpie on the printed timetable and table signs. Everyone will do the best they can with the time/resources they have. Lastly, (not an admonishment, just a lesson for everyone) please do check the table signs so that you don’t set up at the wrong one and leave any players behind at an adjacent table. It could happen to anyone, so check the signage against your own notes of where you’re supposed to be. This can happen to anyone, especially with last-minute changes like cancellations, so be ready for it! Again, the hard work of being a GM makes the day better for so many players, and not only did all the sessions sell out (making our new last-minute seating process redundant), but we had the usual bunch of unregistered players hoping for a chance at a table, and not enough seats for them all. We’re still entertaining the idea of running games on demand, especially if we manage a Sunday in the future. If you’re up for that, let us know! Oh, and thanks to Lu Quade for running a Scum & Villainy demo for Aetherworks, scoring himself an advance copy of the rulebook in the process! I’m envious. Rewards and awards are being posted to everyone today, courtesy of our budget. We know it’s not much, but we like that we can now afford to give you something for each session you run, and a little extra for each Worldbuilder session. Door takings at this event were lower due to [a] more comfortable numbers, [b] No card tournament and [c] Raffle prizes not arriving, but thankfully we had [d] Patreon subsidy, [e] Shirt sales and [f] Noofy’s Pop-Up Fundraiser Stall, so we can still mange it and afford to keep running next year. 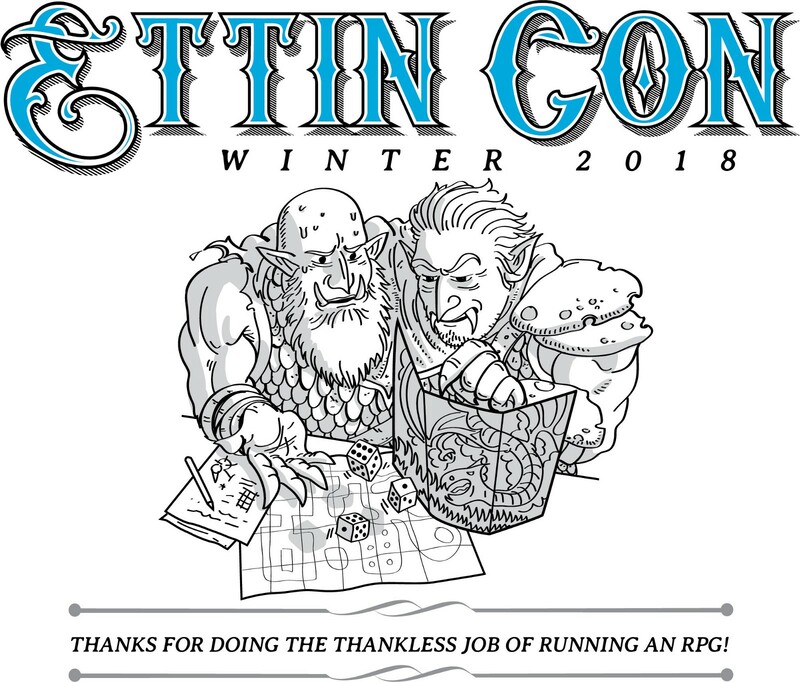 In summation, we love you as always, more than ever and things are only going to get better if we all work together to make Ettin Con the best places for the best GMs. If you have any suggestions, want to help, or know anyone else who’d like to help us plan or run the day, please get in touch! We run a biannual gaming convention, open 24hrs per year. This is where we get to talk about what that job is like, what we’ve learned, & what we hope to teach. Where the Con Orgs share their experiences.